Born in Malaysia, Yap is an accomplished dancer, director, choreographer and visual artist. Tony was one of the principle performers with IRAA Theatre (1989-1996) and has worked extensively in Australia and overseas including 'Agamemnon' Festival Colline Torinese, Italy, and 'The Trojan Woman', Vienna International Art Festival. 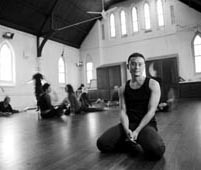 As the founding Artistic director of Mixed Company (now Tony Yap Company) in 1993 he has made a commitment to the exploration and creation of an individual dance theatre language that is informed by psycho-physical research, Asian shamanistic trance dance, Butoh, Voice and Visual design. For Mixed Company Tony has directed 'Icarus', 'Print of a Pulse', 'Narcissus' Dream' and 'St Sebastian'. 'Narcissus' Dream' & 'Icarus' were both nominated in the Best Innovative New Form category for the Melbourne Green Room Awards. Tony has collaborated with many companies and individual in Australia, Indonesia, Austria, Italy, France, Malaysia, Denmark, China, South Korea and Japan. He danced in an international collaborative work in 'The Silence of the Forest' with Company Lian in Paris and 'The Night Gardener' in Marseille for the Mai-diteranee Festival, France. Tony has received numerous nominations and awards including his solo work 'The Decay of the Angel' which won him a GreenRoom Award for Best Male Dancer. Tony received an AsiaLink residential grant to work in Indonesia in 2005. He has recently returned to his place of birth to research into the Malaysian shamanistic trance practice for a solo piece, 'E1'. 'E1' has attracted a wide interest and toured many countries. In October 2007, 'E1' will feature at the Biwako Bienalle in Japan. Tony is currently in a collaborative project at Gwangju, South Korea as part of LACM (Little Asia Creators Meeting). LACM is a cross-cultural, cross-medium collaborative initiative. We are now working on a piece, 'RIAU', inspired by the plight of the nomadic sea people of the Riau Islands, Indonesia. “Tony Yap, ... giving us a centered and grave presence... He can give weight without noise, slowness without tedium, remoteness without indifference...it is always towards him that the eye turns in a quest for emotional interest or meaning..."
"...exquisite...There are real lessons to be learned from the way Yap builds his work. Each element has its place and is given its time, allowing the audience to reflect and absorb the miltiplicity of meanings....The feeling was profound, the silence palpable." Repertoire2 > How could you even begin to understand?